The young girl posing in this photograph has the appearance of a very intellectual child. 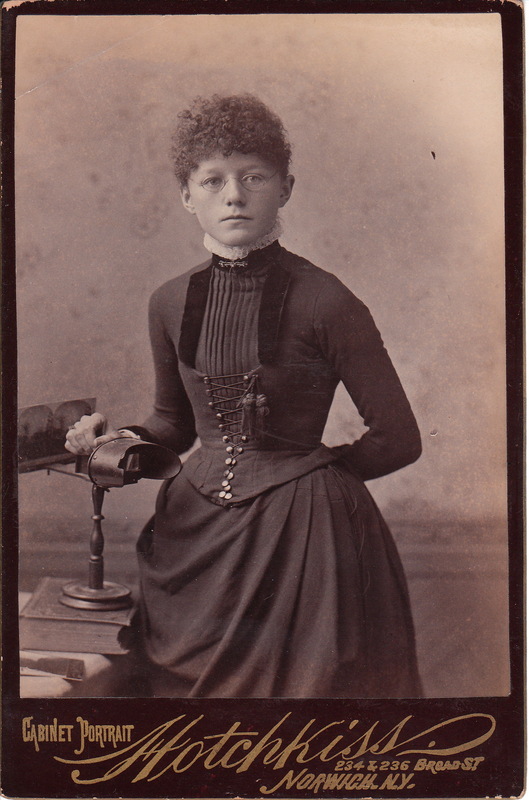 She is standing next to two books atop a table and her hand rests upon a stereoscope. She is wearing a pair of glasses. The girl is identified on the reverse of the photograph as Sema Sage, age 12. The photograph was published in 1887.Stereoscopes were a popular way to view photographs in the late 1800’s and early 1900’s. A popular later version was invented by Oliver Wendell Holmes Sr.. Stereoscopes are used to view stereographic cards. These cards have two separate images printed side by side. When viewing these images through the stereoscope, the focal points becomes more distant, the card image is magnified allowing the viewer to see more detail, and the resulting image is 3-D. This portrait cabinet card was taken by Alston E. Hotchkiss of Norwich, New York. To view other photographs by Hotchkiss, click on the category “Photographer: Hotchkiss”. A lovely couple poses for their portrait at the Hotchkiss studio in Norwich, New York. The gentleman has a terrific mustache and is holding a cane. 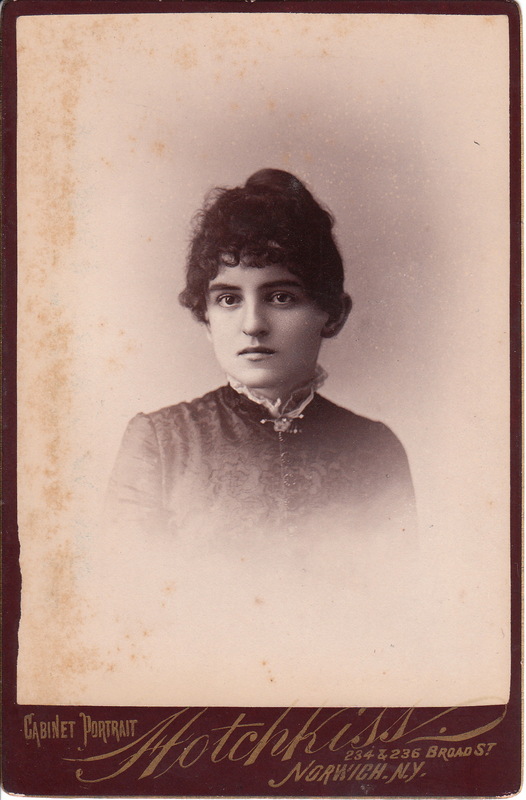 The woman is wearing a lovely dress and is holding a cabinet card. The cabinet card is bent in the same fashion as collectors often find them today. The cabinet card that she is holding is a portrait of a nicely dressed woman photographed by Hotchkiss. The reverse of the cabinet card has the printed date 1889. To view other photographs by Hotchkiss, and to learn more about him, click on the category “Photographer: Hotchkiss”. 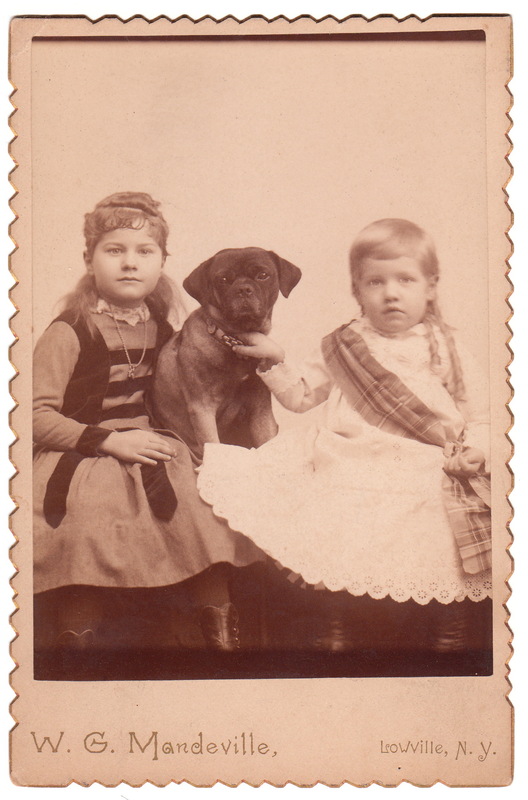 This cabinet card portrait of two children and their pet pug, illustrates the power of the internet in identifying subjects in antique photographs. The reverse of this photograph has some identity clues in an inscription that states “Niles 3 years Grace 6 years Jan 3rd 1889”. Since the photographer of this image (W. G. Mandeville) worked out of Lowville, New York, it was assumed that the children in the photograph lived in, or around, Lowville (located in the western foothills of the Adirondack Mountains). A search of the 1900 U.S. census (Lowville) was done for siblings named Niles and Grace. 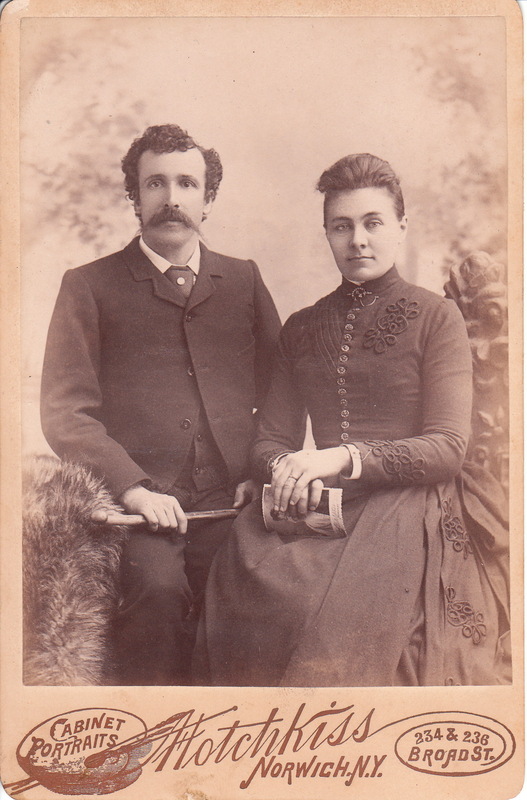 A listing for Niles and Grace Bateman was found and their ages were a match for the age information on the reverse of the cabinet card. Once establishing their identity, additional biographical data was obtained. At the time of the 1900 census, Grace was seventeen years old and Niles was thirteen. Their father was Carroll Bateman and he was a proprietor of a hotel. Their mother was named Jennie Ruggles Bateman. The 1910 U. S. census found Niles working as a clerk in his father’s hotel. The 1920 U.S. census reveals that Niles had become an “Automobile Agent” and was married to a woman named Vera. The 1930 census discloses some major changes in the life of Niles Bateman. He had two children (Walter and Barbara) and had become an “Automobile Dealer”. The photographer of this image, William Garrett Mandeville (1865-1944), is one of the subjects of Robert Ogden’s book, “Exposing the Wilderness: Early Twentieth Century Adirondack Postcards” (1999). Ogden considers Mandeville one of the best photographers of the genre of scenic postcards. Mandeville was born in New York, dropped out of school at sixteen years of age, and in 1883 went to work for photographer, Ogden Hotchkiss. Hotchkiss had a studio in Norwich, New York. To view photographs by Hotchkiss, click on Cabinet Card Gallery’s category of “Photographer: Hotchkiss”. In 1886 Mandeville joined George W. Carter in operating a photography studio but he left the partnership that same year to run his own gallery. He married his wife, Bertha in 1886 and had a daughter (Dorothy). In the 1930 U. S. census, Mandeville, at 65 years of age, was still listed as a photographer. This cabinet portrait captures a pretty young woman with wonderful deep dark eyes. The photographer is A. E. Hotchkiss ( c 1846-1907) of Norwich, New York. Alston E. Hotchkiss cane to Norwich in 1872 at the age of twenty-six. He ran the most popular photo gallery in town and it is reported that he took on the persona of an artistic and cultured gentleman. His wife played a major role in his running the studio and at one point, he employed at least twenty workers. To view other photographs by Hotchkiss, click on the category “Photographer: Hotchkiss”.